Tarpon should be plentiful in the coastal gulf this month as big schools of fish migrate along our beaches. Also look for cobia, tripletail and false albacore (little tunny) in the coastal gulf. 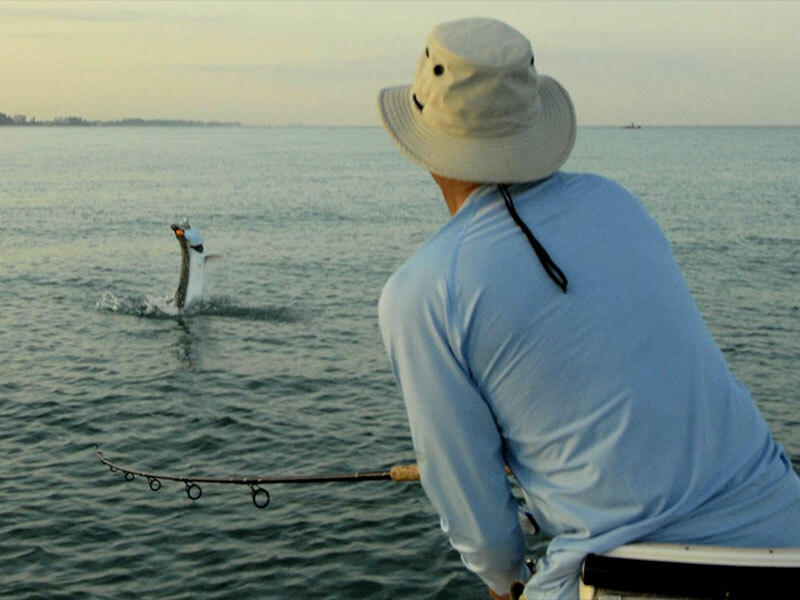 Catch and release snook fishing should also be good in and around passes and in the surf. Fishing for trout and more should be good on deep grass flats. 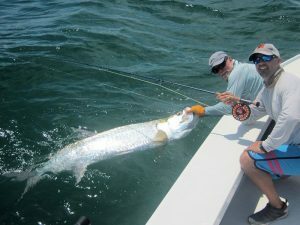 Fly fishing for tarpon should be good during June. May was a tough month for tarpon in the coastal gulf for me this season, either conditions were bad (rough and dirty water, rain and clouds) or when conditions were good, fish weren’t happy (deep and fast-moving). Tarpon fishing is very dependent on conditions and there are a lot of variables that need to come together to be successful. 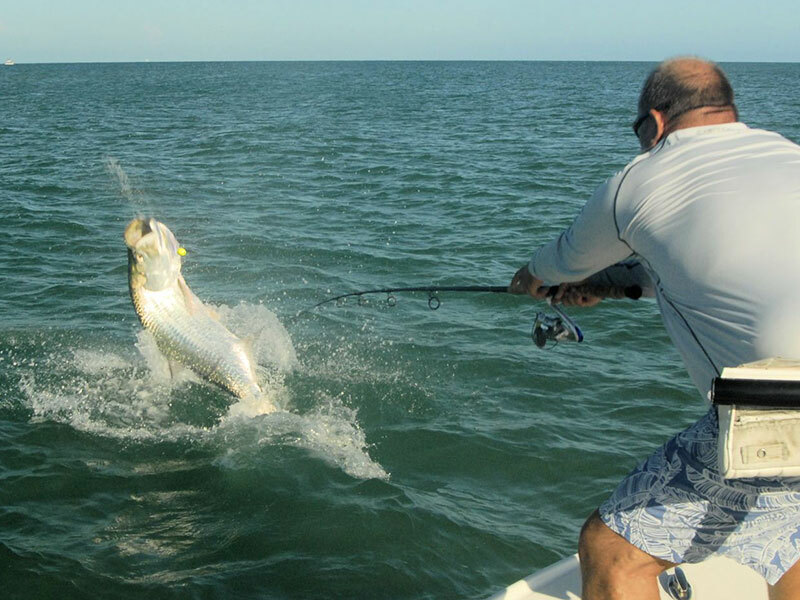 However, tarpon fishing should be strong this month as schools of fish increase in size and numbers. They will head offshore to spawn close to new and full moons. Set up in travel lanes along the beach at first light in the morning and cast live crabs, baitfish, DOA Baitbusters and Swimming Mullet to them. I travel well offshore along the beach in the morning to avoid disturbing schools of tarpon that may be traveling close to the beach. Once you’ve reached the area you intend to fish, ease into the beach with an electric trolling motor and set up in your spot. You can anchor or drift, depending on conditions. Give other anglers several hundred yards of space. Since fish may be moving both north and south, setting up too close to another angler may negatively affect their fishing. Use tackle heavy enough to land them as quickly as possible. When spin fishing, I usually drift a couple of live baits under a float while we wait for tarpon schools to pass by. Blind casting with DOA Baitbusters or Swimming Mullet can also be productive when fish are moving past you but not showing well on the surface. The CAL 4” Shad Tail/Swimbait with a heavy weedless hook is also a good tarpon bait, especially when sight fishing. When fly fishing, I use 12-weight rods and large arbor reels capable of holding 300-yards or more of backing with a 25-pound tippet. I use a variety of baitfish, shrimp or crab fly patterns fished on floating or intermediate sink tip fly lines. The shallower the water, the easier it is to get your fly in front of a fish when fly fishing. Stakeout or anchor in travel lanes to get shots at them. Snook season remains closed this month, so also use tackle heavy enough to catch and release them quickly. You should find them in the surf, in passes and around docks and bridges in the ICW near passes. You can walk the beach and sight fish them in the surf with fly or spinning tackle. Small baitfish fly patterns, CAL jigs with shad tails and jerk worms or DOA shrimp should all work well. The same lures and flies that work in the surf will also work well at night. Snook will congregate in passes around the new and full moons to spawn. They will usually be in deep channels in these areas. Bouncing a DOA TerrorEyz or Baitbuster in bridge channels or passes can be an effective technique in these areas. Fishing for reds should also be good in June. Look for them over shallow grass along mangrove shorelines or around oyster bars when the tide is high. You’ll find them in potholes or edges of flats when the tide is low. Topwater plugs will work well, especially early in the day. I like to cover water with CAL jigs and shad tails or jerk worms to find them. Fly anglers should score with baitfish fly patterns like my Grassett Flats Minnow or Gurglers. You’ll also find big trout in the same areas where you find reds in shallow water. You can use the same lures and flies to catch them although first light in the morning will be prime time to catch a “gator”. You’ll also find trout schooling on deep grass flats along with the occasional Spanish mackerel, bluefish or pompano this month. I like to drift and cast ahead of my drift with CAL jigs and shad tails or jerk worms or DOA Deadly Combos. Fly anglers should score by drifting and casting ahead of the drift with Ultra Hair Clouser flies tied on long shank hooks on an intermediate sink tip fly line. You’ll need to add a few inches of heavy (50 or 60-pound) fluorocarbon when toothy fish are in the mix. Jeb Mulock caught and released this one. In addition to tarpon look for Spanish mackerel, false albacore, cobia, and tripletail in the coastal gulf this month. Although none of them may be thick, I’ve encountered all of them before in June. Keep your eyes open for bird activity or “breaking” fish to find albies and mackerel. Cobia and tripletail may be found around crab trap floats; however, I’ve seen cobia swimming with tarpon schools before. Medium spinning tackle and a DOA Shrimp or CAL jig will get the job done for all of them, although your tarpon tackle would also work well for a big cobia. An 8 or 9-weight fly rod with a floating or clear sink tip fly line is adequate to catch everything except a big cobia, in which case your 12-weight tarpon fly tackle will work well. There are lots of options in inshore waters or the coastal gulf this month. If pulling on a 100-pound tarpon isn’t for you, fishing pressure is usually light inshore this month so snook, trout and more should also be good options. Whatever you choose to do, please limit your kill, don’t kill your limit!